Centers for Medicare and Medicaid Services (CMS) has proposed sweeping reforms to documentation requirements, clinician reimbursement, and the Quality Payment Program (QPP), to begin in 2019. (1) If approved in their current form, the changes are likely to have dramatic net negative effects on outpatient palliative care reimbursement. A detailed review and analysis of all 1,473 pages of the Proposed Rule, plus its addenda, would not be practical here. The reader is referred to the complete text (1) and others’ assessments (2) reviewing its discussions of specific codes, telemedicine, unrelated Relative Value Units (RVUs), the QPP (3), and other issues less directly related to general specialty outpatient palliative care. The sections involving the new documentation and reimbursement paradigm seem poised to have the biggest impacts. Numerous professional organizations have been persistently calling for CMS and other similar stakeholders to eliminate the ever-growing administrative tasks burdening clinicians today that are not meaningfully helping patients. For example, the American College of Physicians’ initiative (4) has avidly encouraged, among other things, the elimination of duplicative and clinically irrelevant documentation and a focus on those administrative elements demonstrated to have clinically meaningful impact. CMS has listened to this universal outcry and is making strong efforts to adjust requirements accordingly through its Patients Over Paperwork campaign. The 2019 Proposed Rule would consolidate the complicated 1995/1997 Evaluation and Management documentation guidelines currently used to support billing for the various levels of outpatient care provided in medical offices (CPT codes 99201-99205 and 99211-99215 for new and established patient visits, respectively). Clinicians would continue to bill for the appropriate level of care provided (levels 1 through 5; see also below). However, levels 2 through 5 would only require documentation corresponding to a level 2 visit; that required for 99201 and 99211 visits would remain unchanged. The Proposed Rule further suggests documentation of straightforward medical decision-making (5) would alternatively be acceptable, as long as medical necessity was established. Clinicians would still retain the options of adhering to current documentation guidelines or to bill based on time. Further, billing for a home visit (CPT codes 99341-99350) would no longer require explaining the medical reason the person could not be seen in the office. CMS indicates reforms pertaining to additional sites of care will be proposed in future years using a step-wise transformation model. The Proposed Rule also suggests ways to eliminate the unnecessary duplication of documentation, such as an unchanged family history, between visits and among clinicians using a shared electronic medical record. While of course other insurers and third-party companies managing the prior authorization system are not obligated to follow CMS’s lead in changing documentation requirements, CMS encourages other stakeholders to similarly reform. CMS’s corollary to these meaningful and appreciated improvements involves uncoupling reimbursement from documentation, providing a single payment amount for level 2 through 5 visits. The Proposed Rule suggests a new, single RVU for the different levels of outpatient care provided during new and established patient visits done in medical offices, regardless of the visit level submitted. The payment amount was determined based on the weighted general frequencies visit levels 2 through 5 were submitted on all 2012 through 2017 claims. CMS accordingly proposes a RVU of 1.90 and 1.22 for new and established visits, respectively. Direct practice expense inputs were similarly established ($24.98 and $20.70). CMS applied these calculations to the available 2018 claims data and suggest the corresponding reimbursement would have been $135 for new and $93 for established level 2 through 5 visits, respectively. The complex data and calculations provided in the Proposed Rule and its Addenda suggest these amounts would generally be similar in 20196 if instituted unchanged in the Final Rule. CMS further proposes the creation of HCPCS G-code “add-ons.” One is designed to account for the increased overall care complexity tackled by clinicians practicing certain areas of medicine, such as oncology, endocrinology, and interventional pain management, reflected in higher frequencies of level 4 and 5 visits in their claim submissions (GCG0X). Another is an attempt to counterbalance the increased practice expenditures primary care clinicians face “…coordinating patient care, collaborating with other physicians, and communicating with patients” more than other clinicians, as described on page 355 (GPC1X). Most clinicians providing outpatient palliative care appropriately almost exclusively submit visit levels 4 and 5 due to the high medical complexity of the patients involved. Further, they are generally highly involved with the same costly services also provided by primary care specialists. 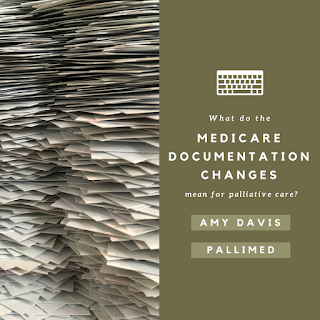 While the chronic care management, advanced care planning, and prolonged face-to-face service codes will remain available to all clinicians, palliative care specialists ironically do not seem to be eligible for either of these add-on G-codes. However, the overall financial impact of these G-codes is expected to be small. The proposed significantly decreased reimbursement, coupled with the G-code inclusion oversight, is likely to result in a major, if not prohibitive, deficit in our ability to provide much-needed outpatient subspecialty palliative care services. 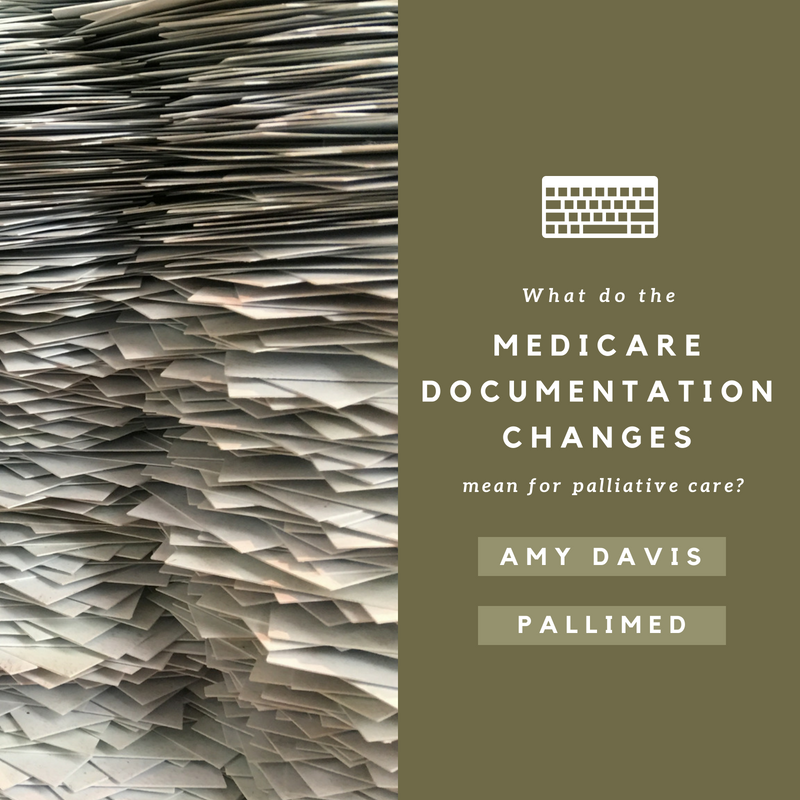 Worse, it may result in palliative medicine specialists intentionally re-classifying themselves as primary care or other alternate covered specialties in order to try to mitigate this potentially devastating financial loss. Many in palliative care more often code visits based solely on the time spent with the patient than those practicing other specialties, primarily due to the nature of our role in helping patients and teams match provided care to the patient’s goals. CMS proposes eliminating the current policy that requires more than 50% of the time-based visit involve counseling and/or care coordination, suggesting the time spent is often a valid surrogate to the visit’s complexity. The face-to-face requirement remains unchanged. CMS also proposes to eliminate the current policy preventing two clinicians with the same Medicare enrollment specialty from receiving reimbursement for care provided on the same day. This will hopefully eliminate patients having to return to the office on a subsequent day or clinicians foregoing reimbursement for the care they provide. CMS’s formal recognition that a clinician enrolled with Medicare as an internist, for example, may also have additional training in another specialty, such as palliative care or geriatrics, is appreciated but will likely benefit a rather limited number of patients and clinicians. The CMS paradigm transformation proposed for 2019 implementation offers a number of very positive reforms. CMS is clearly listening to the global outcry from clinician stakeholders across the healthcare spectrum, and their efforts are sincerely appreciated. However, taken in its entirety, the proposed changes as they stand are likely to result in potentially profound net negative consequences on the provision of outpatient palliative care. It is imperative that palliative care organizations, clinicians, and other stakeholders offer comments (7) to CMS before the comment period ends on September 10th to sustain and support outpatient palliative care. 1 - Medicare Program; Revisions to Payment Policies under the Physician Fee Schedule and Other Revisions to Part B for CY 2019; Medicare Shared Savings Program Requirements; Quality Payment Program; and Medicaid Promoting Interoperability Program. (Prepared by the Center for Medicare and Medicaid Services, 42 CFR Parts 405, 410, 411, 414, 415, and 495 [CMS-1693-P]) Baltimore, MD: Department of Health and Human Services; July, 2018. Accessed 07/17/2018. 3 - Fact sheet: Proposed rule for the Quality Payment Program year 3. (Prepared by the Center for Medicare and Medicaid Services, 42 CFR Parts 405, 410, 411, 414, 415, and 495 [CMS-1693-P]) Baltimore, MD: Department of Health and Human Services; July, 2018. Accessed 07/17/2018. 4 - Erickson SM, Rockwern B, Koltov M, McLean RM, for the Medical Practice and Quality Committee of the American College of Physicians. Putting Patients First by Reducing Administrative Tasks in Health Care: A Position Paper of the American College of Physicians. Ann Intern Med. 2017; 166: 659–661. 5 - The current guidelines for a 99202 visit include an expanded problem-focused history (chief complaint and one history of present illness element), an examination with at least two (1995) or six (1997) elements, and straightforward medical decision-making (minimal diagnosis and minimal risk, with or without data). The current guidelines for a 99212 visit include two of the three: a history containing the chief complaint and one history of present illness element, one examination element, and/or straightforward medical decision-making (minimal diagnosis, one stable problem, and minimal risk, with or without data). 6 - The lack of specificity in the Proposed Rule, and anticipated changes when finalized, make conclusive detailed amount determinations impossible. Sincerest thanks to Dr. Christopher Jones and to those who wish to remain anonymous for discussing this complex topic with me. 7 - All comments received through Sept. 10 will be reviewed. Send comments via: (1) http://www.regulations.gov and follow the “submit a comment” instructions, (2) (regular mail) Centers for Medicare and Medicaid Services, Department of Health and Human Services, Attention: CMS-1693-P, P.O. Box 8016, Baltimore, MD 21244-8016, or (3) (express mail only) Centers for Medicare and Medicaid Services, Department of Health and Human Services, Attention: CMS-1693-P, Mail Stop C4-26-05, 7500 Security Boulevard, Baltimore, MD 21244-1850.